Marine Corps Air Station Iwakuni and Iwakuni City leadership participated in the 10th Joint Leadership Walk in Iwakuni City, March 15, 2019. The purpose of the biannual walk was to have leaders within each community come together to ensure Iwakuni remains safe so the two communities can continue living in harmony. Leaders that were present during the walk were U.S. Marine Corps Col. Richard F. Fuerst, the commanding officer of MCAS Iwakuni; Sgt. 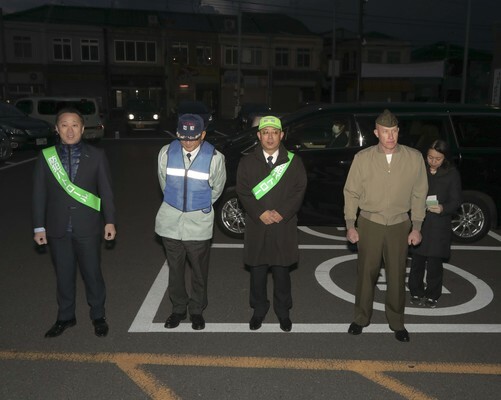 Maj. Joseph S. Gregory, the sergeant major of MCAS Iwakuni; Yoshihiko Fukuda, the mayor of Iwakuni City and other Japanese government officials. The walk consisted of touring popular local areas where they spoke to business owners as well as Japanese and American customers. The two leaders also answered questions from the local media on topics affecting local Japanese and air station residents. VIPs that also attended the walk were Masahiro Akase, director general of Chugoku Shikoku Defense Bureau and Yasutake Lida, director of the Yamaguchi Prefectural Iwakuni Citizen Affairs Bureau. Mayor Fukuda also mentioned his dedication to the safety of both communities by stating he will directly speak with Marines and Sailors at weekly safety briefs. Since 2009, the walks have been a display of unity between the leaders of each community and help ensure continued harmony through communication, partnership and understanding.